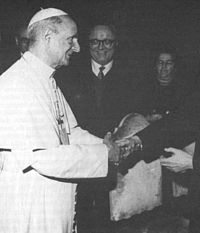 When war broke out, Maglione, Tardini, and Montini were the principal figures in the Secretariat of State of the Holy See. 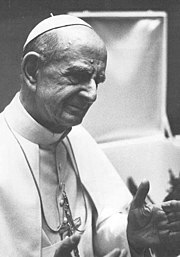 [page needed] Montini was in charge of taking care of the "ordinary affairs" of the Secretariat of State, which took much of the mornings of every working day. In the afternoon he moved to the third floor into the Office of the Private Secretary of the Pontiff. Pius XII did not have a personal secretary. 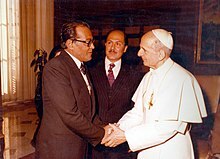 As did several popes before him, he delegated the secretarial functions he needed to the Secretariat of State. During the war years, thousands of letters from all parts of the world arrived at the desk of the pope, most of them asking for understanding, prayer, and help. 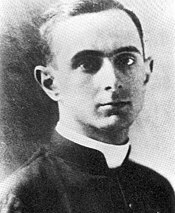 Montini's task was to formulate the replies in the name of Pius XII, expressing his empathy, and understanding and providing help, where possible. 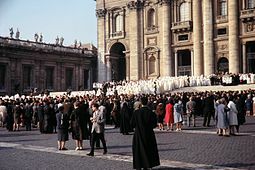 In 1968, with the motu proprio Pontificalis Domus, he discontinued most of the ceremonial functions of the old Roman nobility at the court, save for the Prince Assistants to the Papal Throne. He also abolished the Palatine Guard and the Noble Guard, leaving the Swiss Guard as the sole military order of the Vatican. ^ Commissio Theologica Internationalis, Catholic Church (21 August 2009). Sharkey, Michael; Weinandy, Thomas, eds. International Theological Commission, Vol II: 1986-2007. p. 208. ISBN 978-1586172268.